We at Flower Gift Korea use the best quality flowers and keep our flowers in the best condition. More often than not, we purchase the flowers that will be used in the products after we have received your order, so our flowers will last longer than flowers bought at your neighborhood florist, since they use whatever flowers they currently have at their shop. When you receive flowers from Flower Gift Korea, it is important to take care of the flowers, so that they can last as long as possible. Keep the flowers out of the sun, keep them cool, keep them away from fruits and vegetables, and make sure that the stems of the flowers continually have access to clean (room temperature) water. Think of flowers as babies, so take good care of them! Just because a rose may have a few blemishes, doesn’t mean it is going to die soon. 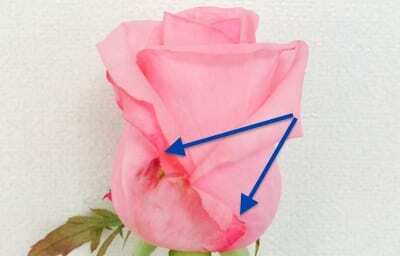 For example, the image of the rose shows two parts of the rose that may seem to be damaged. However, this is just an outer (guard) layer petal that has some discoloration. This is fine. You shouldn’t pluck the petal off even though you will be tempted to. If you do decide to pluck off the petal, you will greatly damage the rose and the whole rose will die much quicker. That outer layer is keeping the rose together, so it is in your best interest to “leave” it attached. Also, it gives it a more natural look. Each Gerbera comes with its own plastic covering that surrounds the petals of the flower. 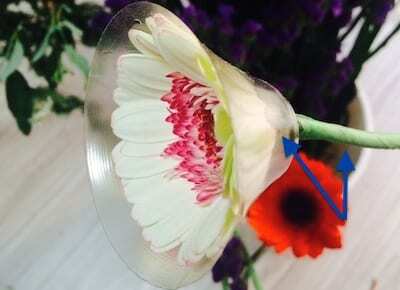 Each plastic covering must be kept on to keep the flower from flattening out and dying very quickly. The florist will trim the plastic covering to make the flower bloom a little bigger (for display), but you should never take off the capsule. Also, each Gerbera flower has a metal wire attached to the stem to better support it. You can see that it has been wrapped with green floral tape to keep it in tact. 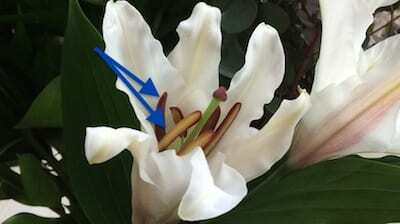 As lilies bloom, it is important to pull out the “anthers”, so that they don’t stain the inner part of the petals. You can see that this lily has “6” in total; the two blue arrows are pointing to two separate ones. You must take these out before they dry out because they will stain the inside of the lily with a yellowish/brownish stain. Hydrangeas need a lot of water because each of the petals and the leaves on the side need water. It is important to keep them well watered. If you receive a basket with hydrangeas, I would take them out of the floral foam and place them in a small vase or cup to keep them alive longer. Most cut flowers just need to be well watered and kept out of the sunlight. It is very easy to take care of flower baskets. The flower in the flower baskets have been arranged onto a piece of (green) floral foam, which has already absorbed water. It is important to keep the floral foam wet to ensure that the cut flowers get enough water. However, if you have individual flowers that require a lot of water, like hydrangeas, I would take those flowers out of the floral foam and place them in a separate vase.